To get to the outskirts of Seoul, the following four stations can be used: Seoul Station, Cheongnyangni Station, Yeongdeungpo Station, and Yongsan Staion. Seoul Station is the starting point for the Gyeongbu Line, the Gyeongui Line, and Incheon International Airport, and it connects to Subway Lines 1 and 4. 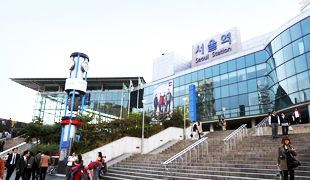 It is considered to be the gate of Seoul, and some 90,000 people use the station daily. The Saemaul train, Mugunghwa train, and KTX are operating on the Gyeongbu Line. The Tongilho, Saemaul, and Mugunghwa trains go toward Daejeon, Gimcheon, Dongdaegu, and Busan; whereas KTX goes toward Gwangmyeong, Daejeon, Dongdaegu, and Busan. The Gyeongui Line in the metropolitan area goes toward Ilsan, Geumchon, and Munsan. Yongsan Station is the last station on the Honam Line, Jeolla Line, Janghang Line, and Gyeongwon Line. It is also a subway station of Line 1, and is located between Namyeong Station and Noryangjin Station. It is the first and last station of the metropolitan Jungang Line. It is used as the first and last station for the ITX Cheongchun Railway, which passes through the Jungang Line and the Gyeongchun Line. Operates the KTX, Saemaul train, and Mugunghwa train, which go to the Honam Line. It processes passengers and cargo, and does ticket sales. Cheongnyangni Station is on the Gyeongwon Line, and is located between Wangsimni Station and Hoegi Station. It is also the first and last station of the Jungang Line. A transfer passage between Cheongnyangni Station of Subway Line 1 and the above-ground station of the Jungang Line has been opened. It is the last station for the sub-express railway Gyeongchun Line, “ITX-Cheongchu,”’ which was opened in Feb. 2012. This is a train station on the Gyeongbu Line. It is located between Singil Station and Sindorim Station of Seoul Subway Line 1. An express train stopped at this station for the first time in 1971. It operates the Saemaul train, the Mugunghwa train, and the metropolitan subway. It deals with passengers, cargo, and does ticket sales. As of Nov. 2010, KTX also stops at this station. It is a privately funded station, and a Lotte Department Store is located near this station.